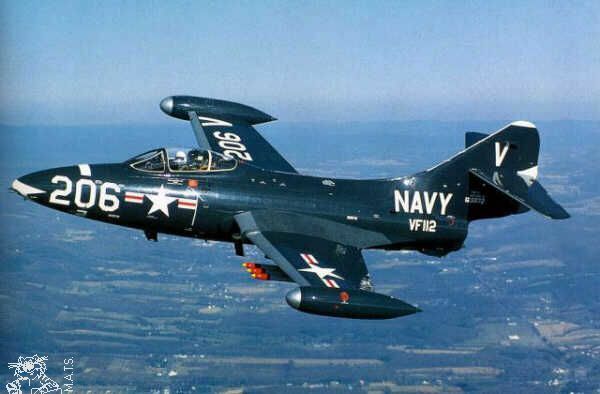 The F9F-5 Panther was the first jet fighter designed by Grumman. The first of two XF9F-2 made its maiden flight on 24 November 1947. Unlike the three prototypes, all production Panthers had permanent wingtip tanks. Different jet engines were tested and the final F9F-5 had a 2 feet fuselage extension and a taller fin. The carrier-based F9F-2s made history when they became the first US Navy jets to down a jet fighter MiG-15 over Korea on 3 July 1950. Apart from the five prototypes (2 XF9F-2, 1 XF9F-3, 1 XF9F-4, 1 XF9F-5), a total of 477 F9F-2s, 69 F9F-3s, 655 F9F-5s and 28 F9F-5Ps (reconnaissance aircraft) were built. Some of the Panther were converted to target drone or drone controller F9F-5KD (redesignated DF-9Es in 1962).